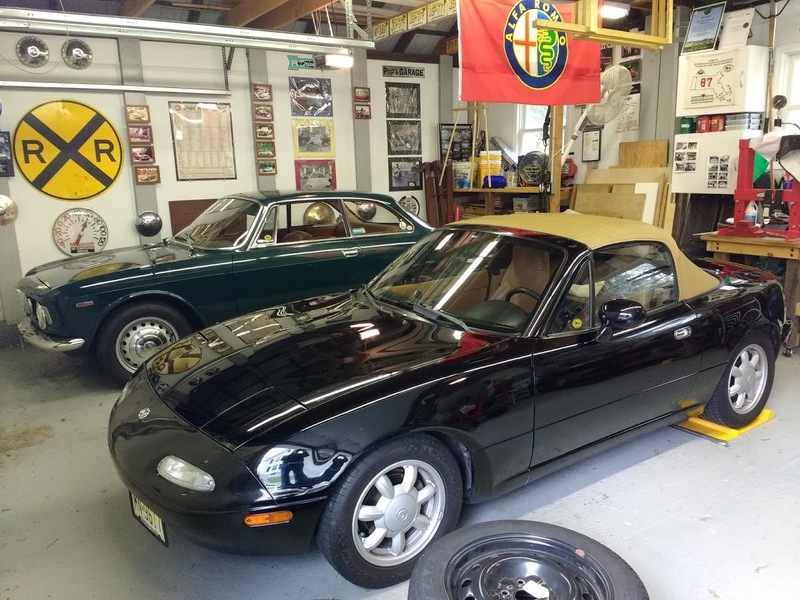 If your memory is good, you may recall that way back in December of 2017, I filed a blog post entitled “Winter Storage, and the Start of the Miata’s Next To-Do List”. Somewhere in there, I wrote words to the effect that “should we have a mild winter, I’ll be attending to some maintenance, repair, and detail items for the Miata”. 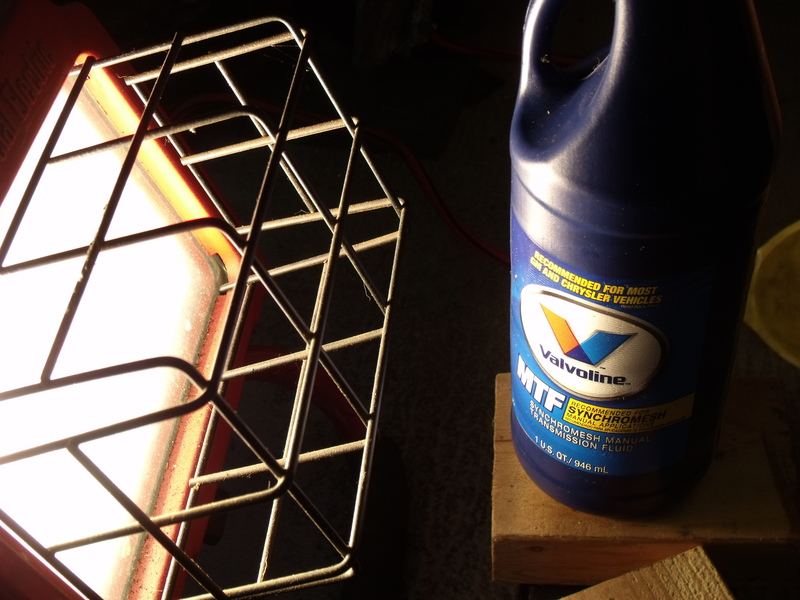 While certainly not a terrible winter, it was plenty cold; too cold to spend much time in the unheated garage. But the calendar claims that spring is around the corner, even if the thermometer has yet to catch up. 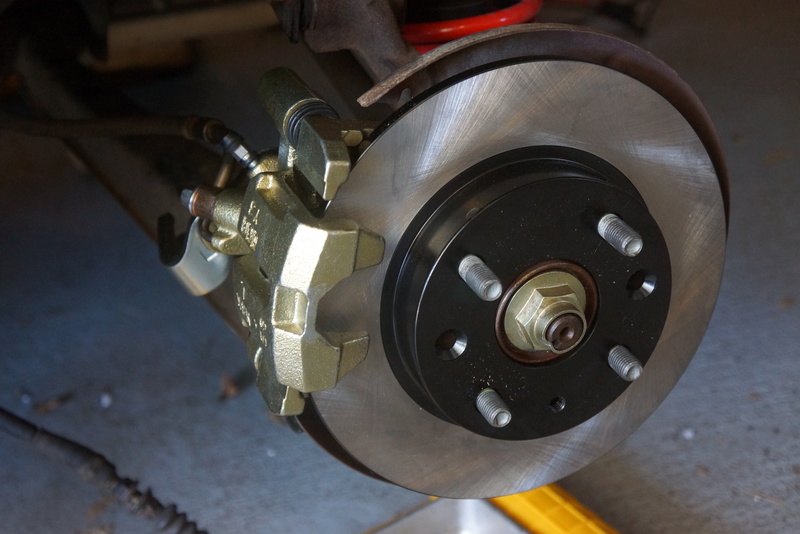 A few weeks ago, cold or not, I decided to forge ahead with the car’s #1 priority: the replacement of the rear brakes, including pads, rotors, and calipers. 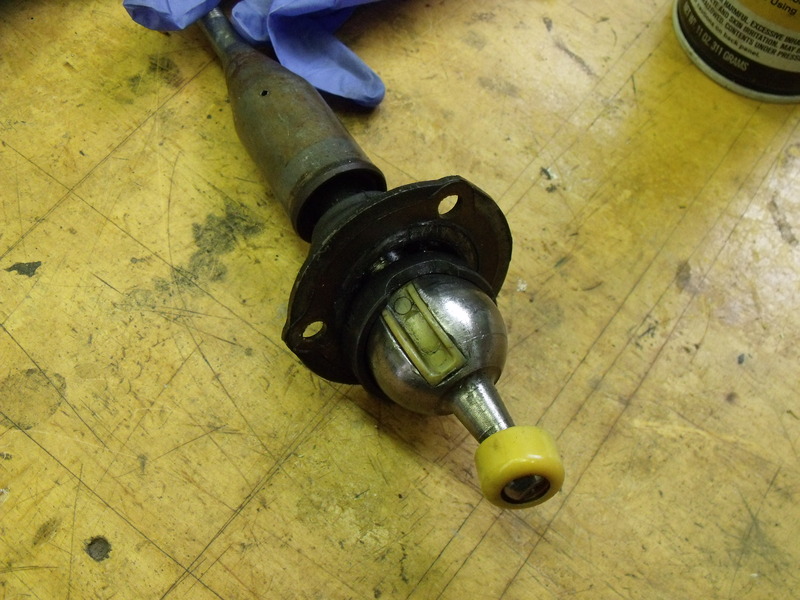 The Mazda’s parking brake has been loose for a while, requiring a long pull of the handle before it would engage. Attempts to adjust it were for naught. It turned out that the piston in one of the rear calipers couldn’t be adjusted in either direction. 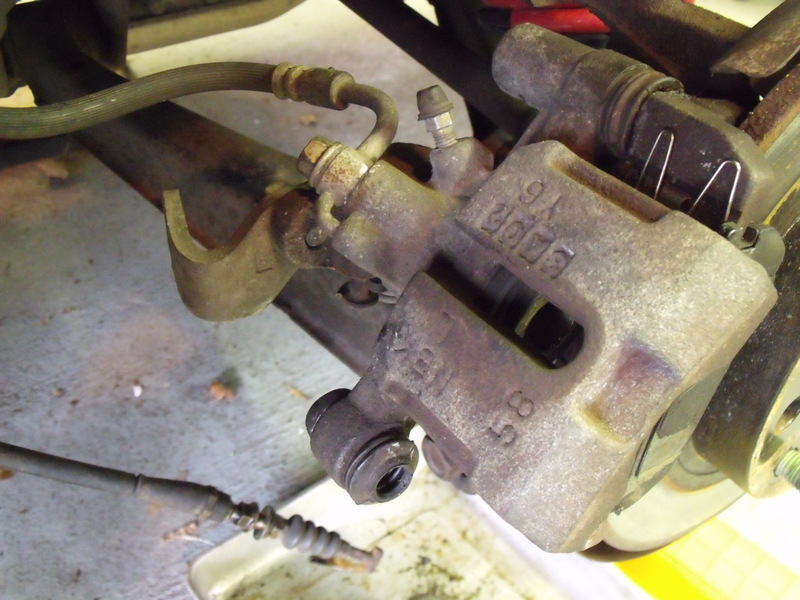 Unlike the European cars I’m accustomed to, this Mazda’s e-brake operates directly via cables on the brake calipers, moving the pistons inward to contact the pads and apply the hand brake. 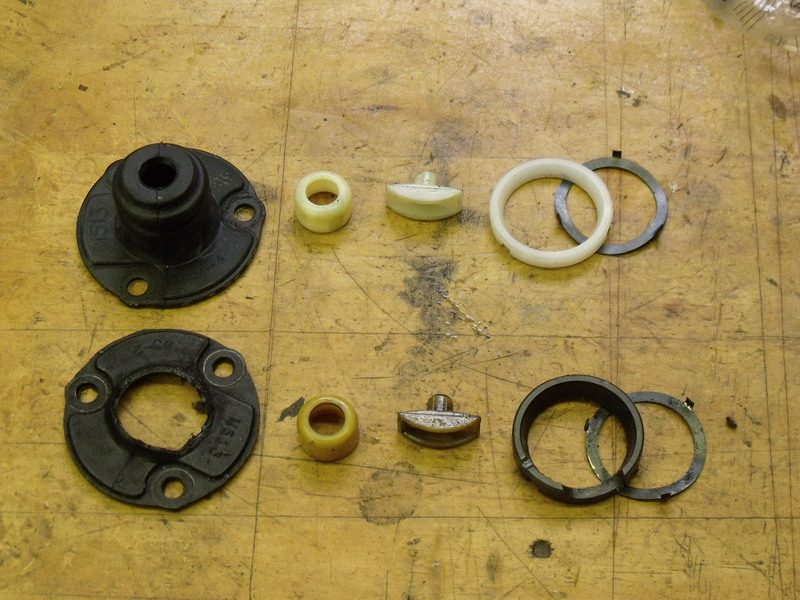 Each rear caliper piston should be able to be rotated inward or outward as an adjustment. All my Volvos used a set of parking brake shoes inside the ‘hat’ of the rear rotor, in essence giving you a drum brake within the disc brake. 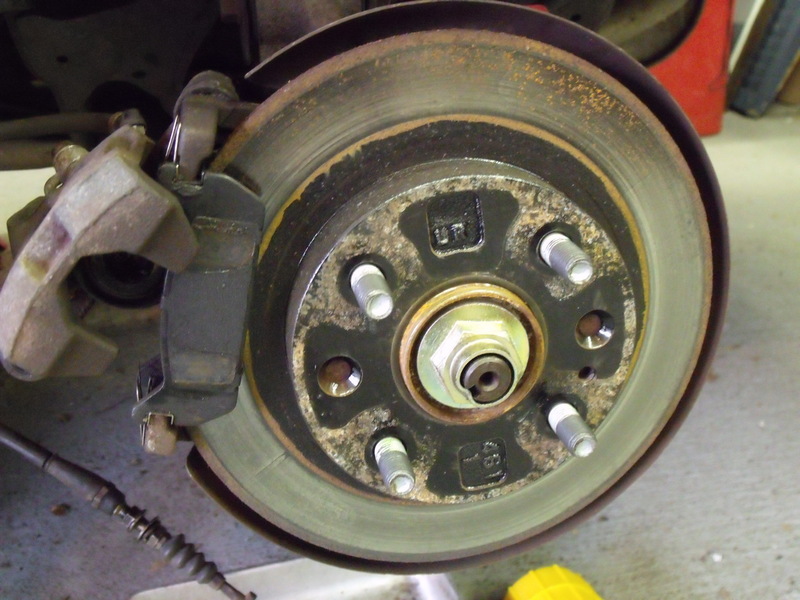 While it has its advantages, I’ve seen cases where the e-brake shoes rust and seize inside the rotors. When that happens, your first tool of choice is a large hammer, and the repair procedure reverts to incessantly beating on the rotor to free it from the shoes. But back to the Miata. I ordered parts through my place of business from Centric. I had my choice from a number of reputable brake parts suppliers, and I chose Centric after learning some detailed information from one of their reps. He informed me that if one orders the LOADED calipers (with pads installed), the calipers receive an anodized finish, compared to the SEMI-LOADED (hardware but no pads) ones, which are cleaned, but are left with a bare metal finish. 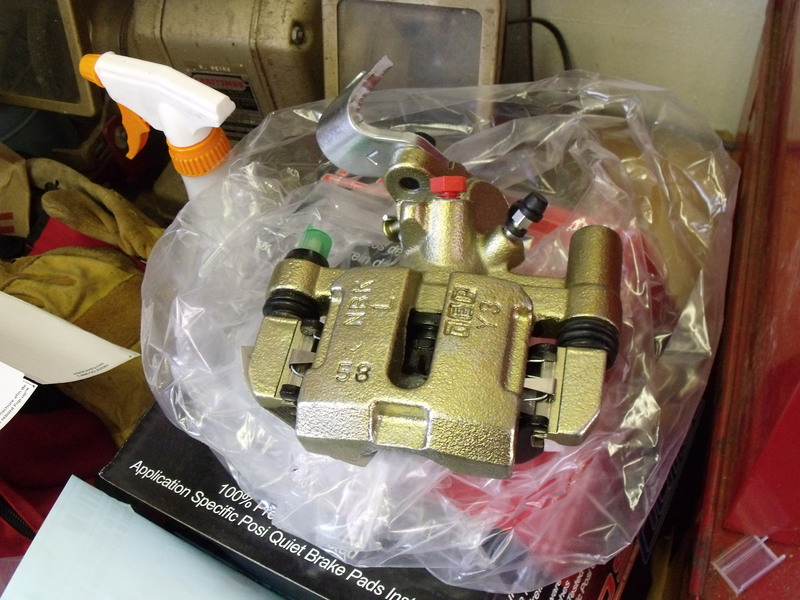 All the calipers are remanufactured (‘reman’) units, and carry a core charge, refunded once the old parts are returned. 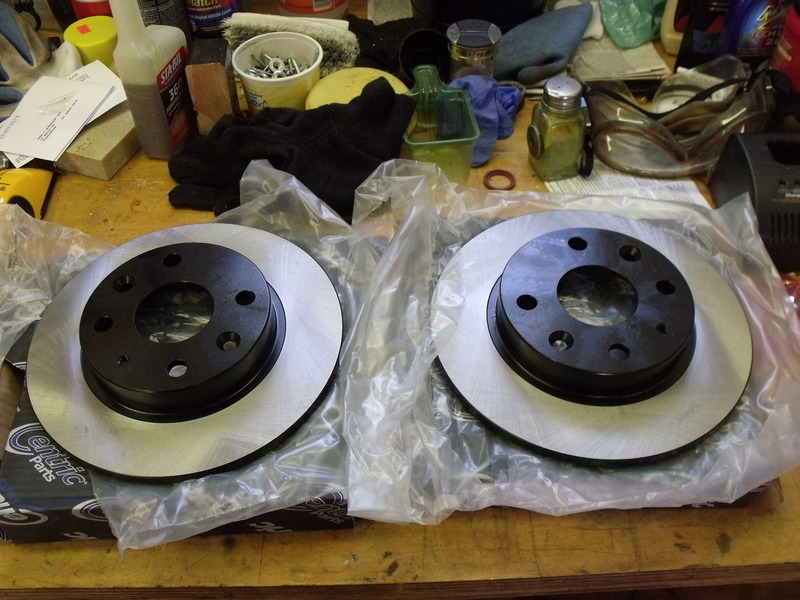 I also stepped up for higher-quality rotors which have a black e-coating on the non-contact surfaces, to prevent rust. All the parts arrived last week, and initial inspection showed that everything looked copasetic. In order to get my core charge refunded ASAP, I used this most recent weekend to install the calipers. Once the order was placed, but before the parts arrived, I removed the parking brake cables, and loosened all the caliper bolts, including the hydraulic lines, to ensure that I’d have no surprises during installation. Centric makes a big deal about reinforcing the message to the customer that the core return must include the caliper and parking brake brackets. I’d presume that would be obvious as they are included on the reman caliper, but perhaps not. The job could not have been more straightforward. Centric even provides new banjo bolts and copper o-rings for the hydraulic fittings. Starting with the left side, I bolted everything up, but had a slight drip from the brake line. It turned out that one of the old o-rings was stuck to the line, and I hadn’t seen it. Once I removed it, everything snugged up and stayed dry. 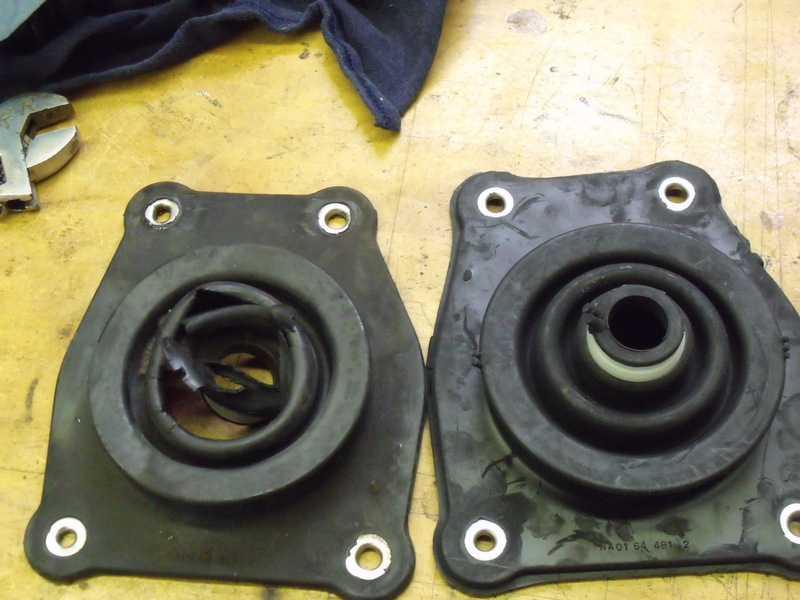 Then I had the exact same problem on the right side, only there was no double o-ring in the way. To stop the drip, I had to resort to reusing the old o-rings. For some reason, the new o-rings are ever-so-slightly larger than the old ones. While it’s good for now, I will get to the store and buy new copper o-rings to make sure that I’ve got fresh ones installed. I’m still not sure why it’s leaking with the new o-rings, but I can get back to that later. Both old calipers, with the necessary brackets, are off the car, and are boxed up and ready to be shipped back to Centric, which I’ll attend to this week. 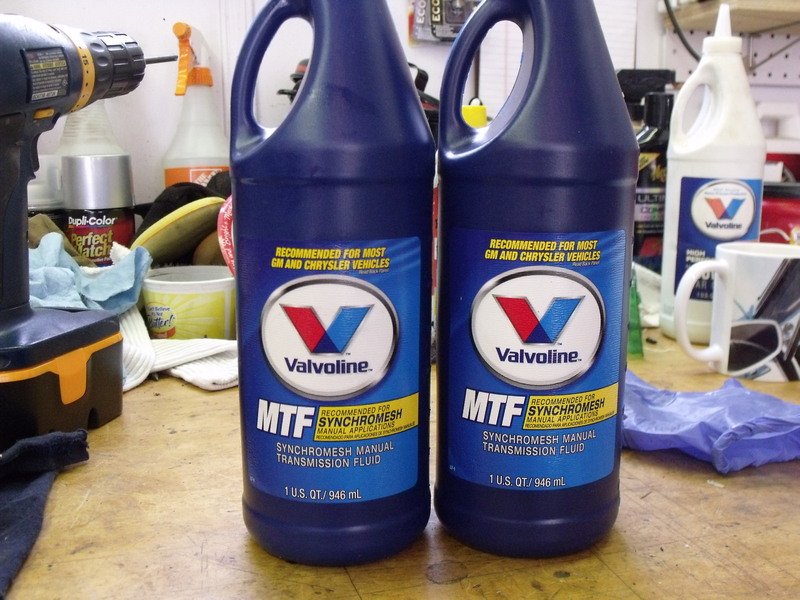 In the meantime, I placed an order for Valvoline “synchromesh manual transmission fluid”, which comes highly recommended for my five-speed by the guys and gals on the miata.net forum. Weather permitting, I’ll tackle that next weekend. Looking for the next installment of the Isetta Saga? So am I. Once I find it, which should be during the upcoming week, I’ll spiff it up and get it online for your reading enjoyment by next weekend. 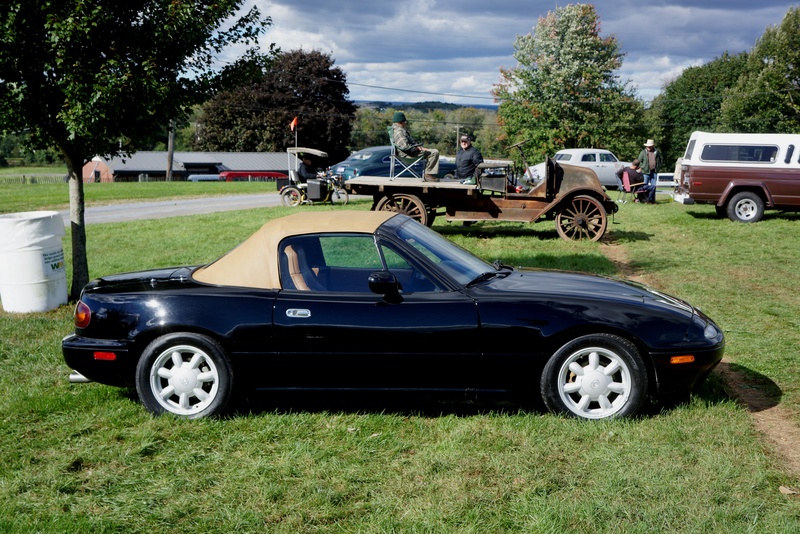 The first-generation Miata, known as the “NA” version, was launched in 1989 and sold through 1997. Mazda sold over 400,000 units, a runaway success by anyone’s definition. As happens every winter, the collector cars (loosely defined as the cars that don’t get driven in snow) are put away for the winter. The ritual is one that has evolved over the years and is now consistent: fill the tanks with fresh fuel, add Sta-Bil, pump up the tires at least 10 p.s.i. over normal to avoid flat-spotting, put a trickle charger on the batteries, and cover the cars with a dedicated car cover. It’s easy, takes little time, and doesn’t cost very much. 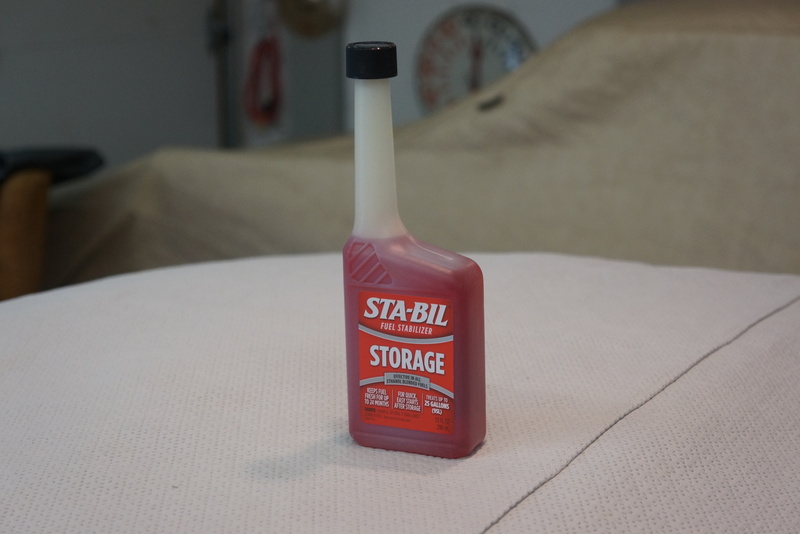 The Sta-Bil brand of fuel stabilizer, made by Gold Eagle, has been in use in my garage since I’ve owned powered lawn and garden equipment. 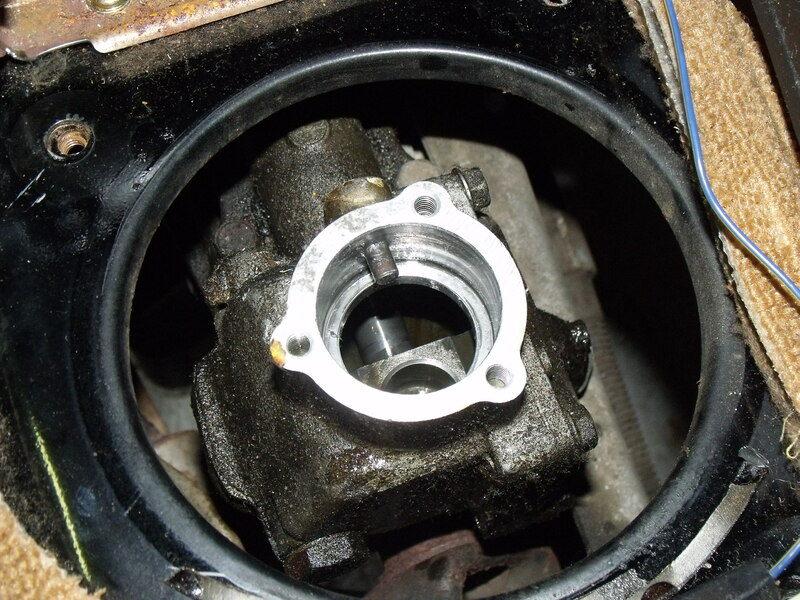 Many moons ago, I heard stories about lawn mowers and snow throwers, two examples of gas-engine devices which see seasonal use, failing to run because the old gummed-up gas gummed up the works. As soon as I got my first lawn mower, Sta-Bil went into its tank. The gumming has never happened to me, and I’ve stuck with the brand ever since. Yes, I had my doubts about their ethanol treatment after it seemingly made the Alfa run worse (a conclusion which I now doubt since discovering my carbs are running rich and fouling the plugs a bit), but your basic ‘storage’ version of Sta-Bil is the way to go for any fuel tank in which fuel may sit more than 6 weeks or so. It’s a similar story with battery chargers. 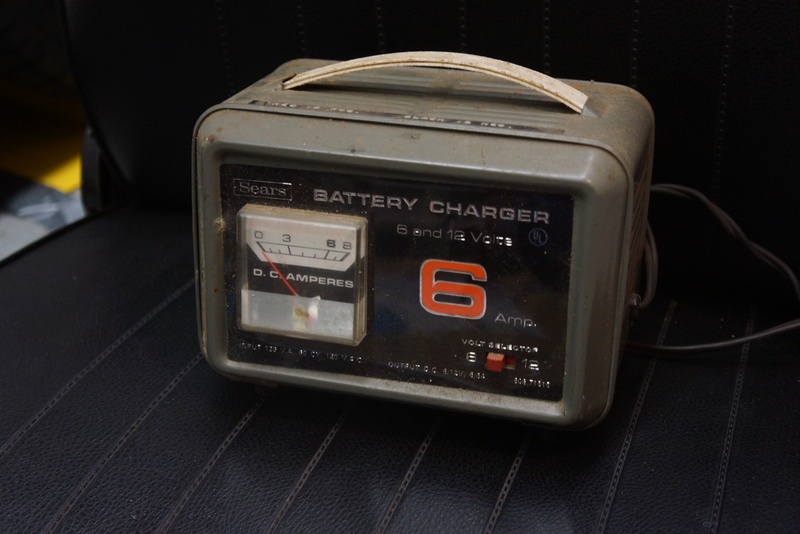 I still have my dad’s Sears charger, which looks like it was made in the 1960s. It works great to jump-start a dead battery, but it ain’t no trickle charger. Long-term battery storage requires both a slow charge (the “trickle”) and a volt-sensing cut-out that won’t overcharge the thing and boil it to death. 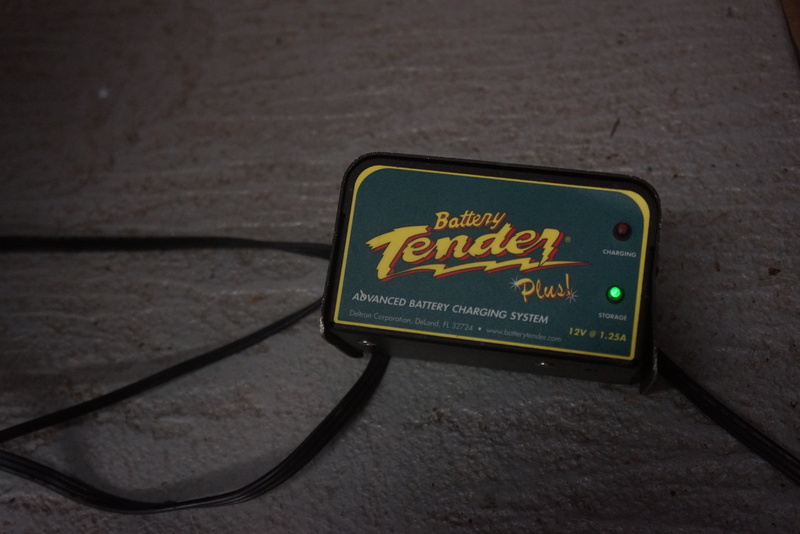 The Deltran Battery Tender brand came onto the market several decades ago, and they found their niche for the car collectors whose vehicles are stored in the off-season. 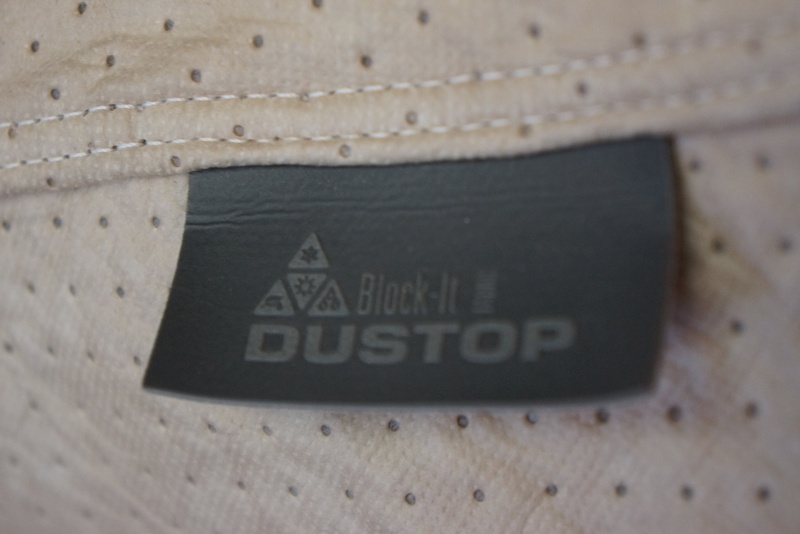 While many competing brands have since been introduced, I’ve stayed with what I know works. I think I’m up to 3 of these Battery Tenders in the garage. Car covers are a relatively new accessory to my winter arsenal. Up until a few years ago, frankly, I didn’t believe in them. It was a combination of fear of paint damage from moisture trapped beneath the cover, and frustration with my inability to find a custom-fit cover for the BMW Isetta (my expectations were a bit high with that one). Since working at CARiD, I’ve learned a lot about the usefulness of good quality car covers, and one thing I learned is that the Covercraft brand is my favorite. The fit is perfect, and the variety of material choices will satisfy any indoor or outdoor cover needs at any price point. 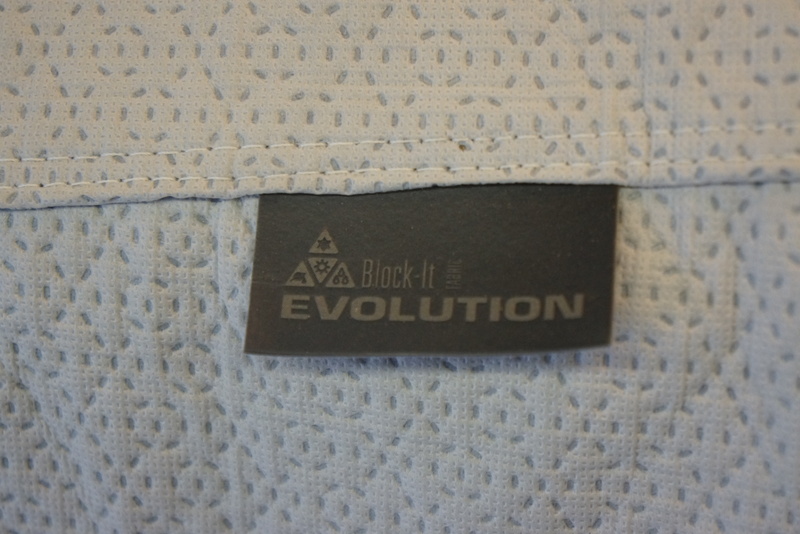 The Alfa has a Covercraft Block-It Dustop (yes, they had the ’67 Alfa pattern in stock), and the Miata wears the Covercraft Evolution indoor-outdoor cover. 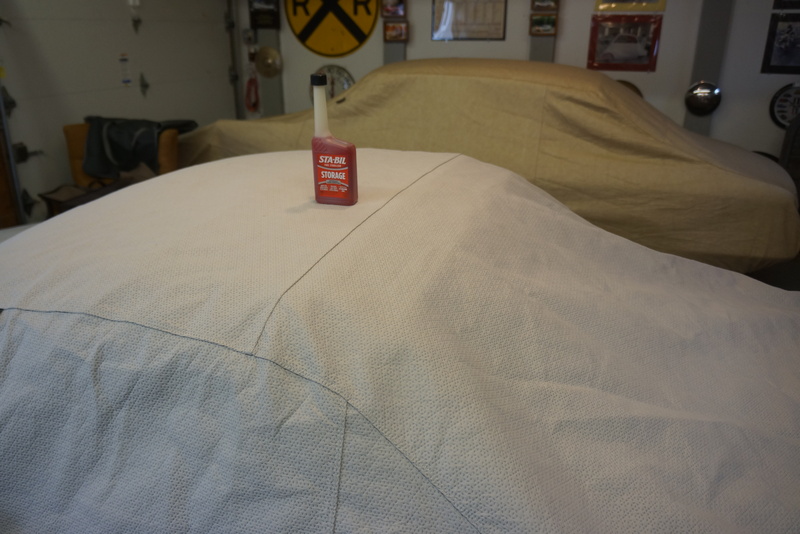 In the garage, both covers do more than keep dust off the paint; they also protect the interiors from sunlight, and provide some protection from wayward nuts and bolts spinning out of control off my workbench. I would never again think of storing a car without a cover. Even in the nice weather, if it’s going to be more than a week or two before one of the cars gets driven again, the cover goes on. All this is a prelude to an announcement about my Mazda Miata: after giving some thought to selling it, I’ve now decided to keep the car. 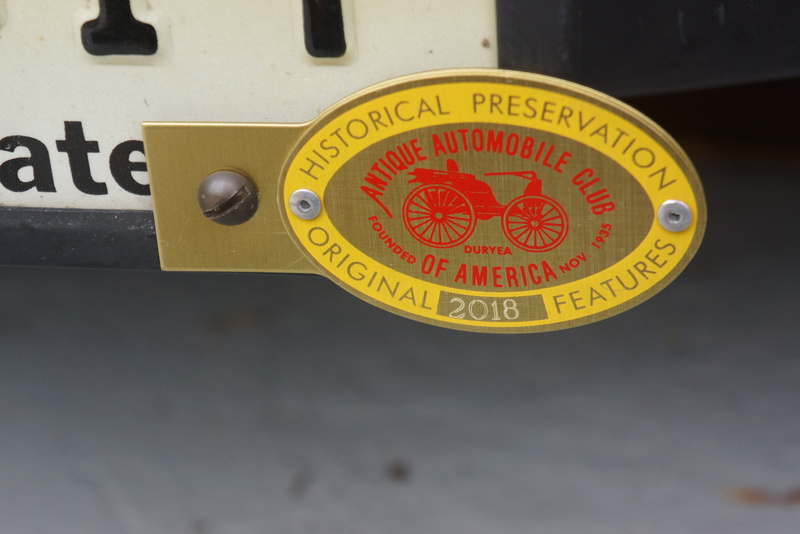 What’s more, next year, in 2018, this 1993 automobile will be 25 years old, making it eligible for AACA events. So I’m going to turn it into a show car. The plan is to spend the winter tending to some mechanical maintenance, but also attending to some detail work in order to display the car at shows next year as a 25-year-old original unrestored car. The mechanical list includes new rear brake calipers (one of the parking brake adjusters is stuck), new tires (tread is good, but they’re 10 years old), and a continuation of the LED bulb upgrade. 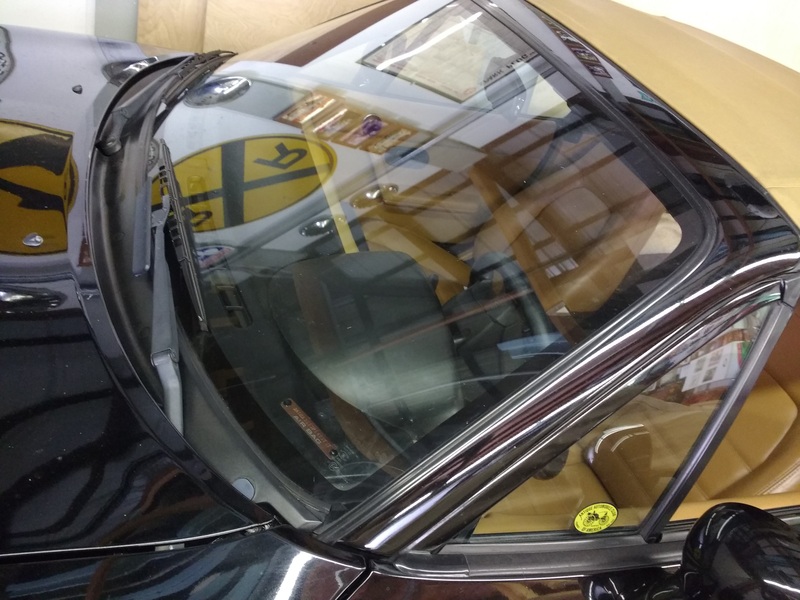 The detail work involves a new convertible top (worn and dirty), an engine compartment detail, Paintless Dent Removal work on some small dings, and a complete polish and wax. Here’s hoping for a mild winter, which will encourage me to get out to the garage! As long as the temperature is above freezing, I can spend a few hours out there. Watch this blog for updates on my progress with the Miata. 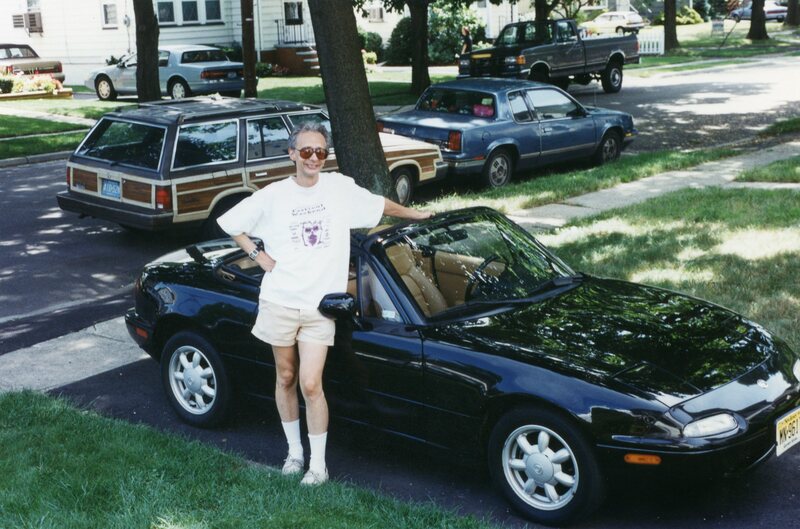 In the 21 years since I purchased my 1993 Mazda Miata, and during the 70,000 miles of driving enjoyment I’ve had behind the wheel, there is one peculiarity that has come to my attention. Not really. However, the automotive landscape has gone through tremendous upheavals since 1996. When I bought the Miata, from a young woman in her 30s who had purchased it new, I asked her “what will you be replacing it with?” She replied “a Chevy Blazer”. At that point in time, the concept of voluntarily moving from a two-seat sports car to a Sport Utility Vehicle was a foreign one. But no longer. In 2017, the majority of daily-driven vehicles are classified as “light trucks”: minivans, SUVs, and pickup trucks. 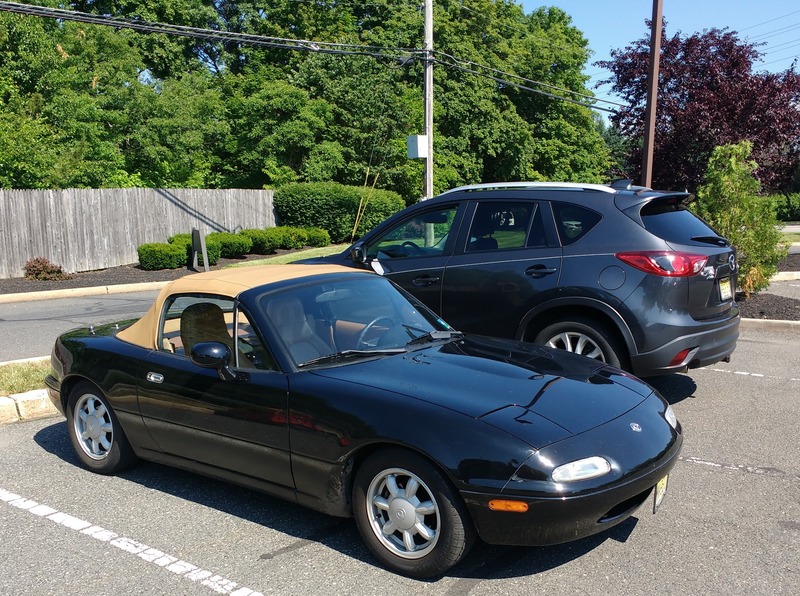 It is in that sense that my Miata has gotten smaller, as without exaggeration, every four-wheel contraption sharing pavement with me towers over my windshield. Pulling up next to a late-model Accord or Camry at a stop light is a lesson in relativity, as I observe that those mid-sized sedans’ beltlines are higher than my roof. 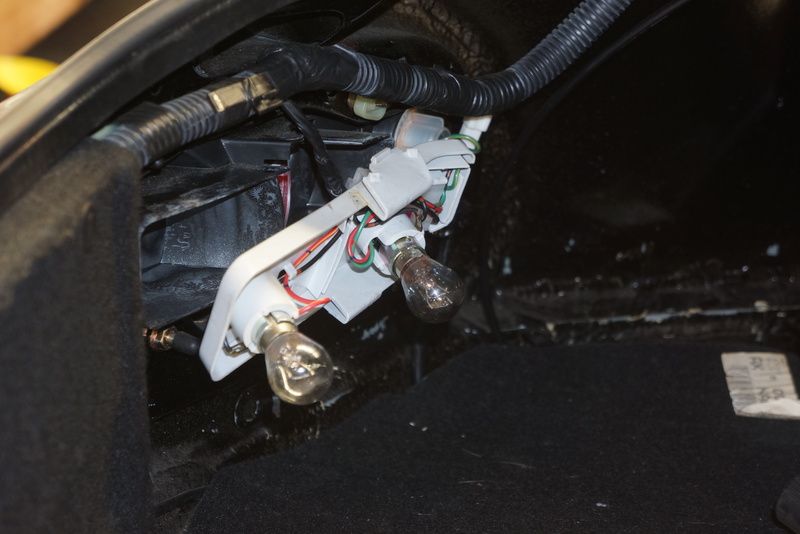 As the title of this blog post is “Installing LED lights in my Miata”, you may wonder what the foregoing has to do with LEDs. Plenty, in fact, and it’s summed up in the word conspicuity. There are two aspects to vehicular lighting, as I was taught in Automotive Safety 101: being able to see, and being seen. Other than headlights, and perhaps reversing lights, a vehicle’s exterior illumination is designed to help other drivers see you. 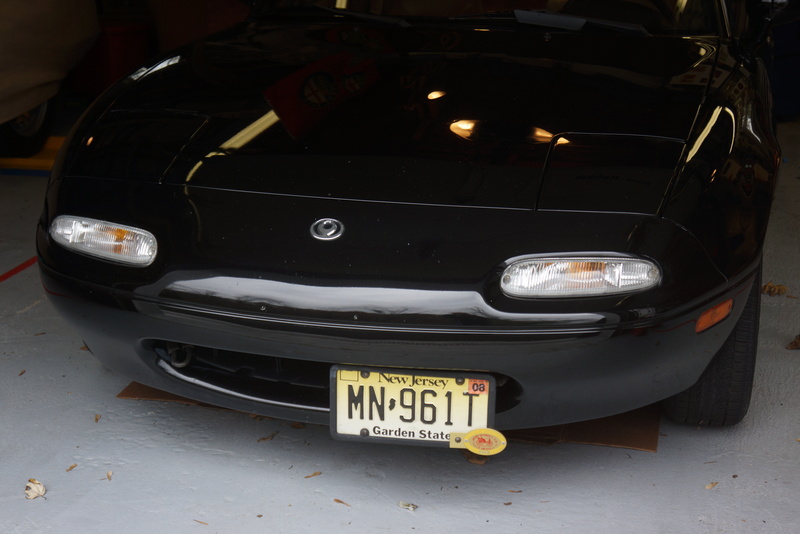 A few weeks ago, it occurred to me that there was a super simple way for me to make the Miata more conspicuous to other drivers, and that would be by installing some LED lights. 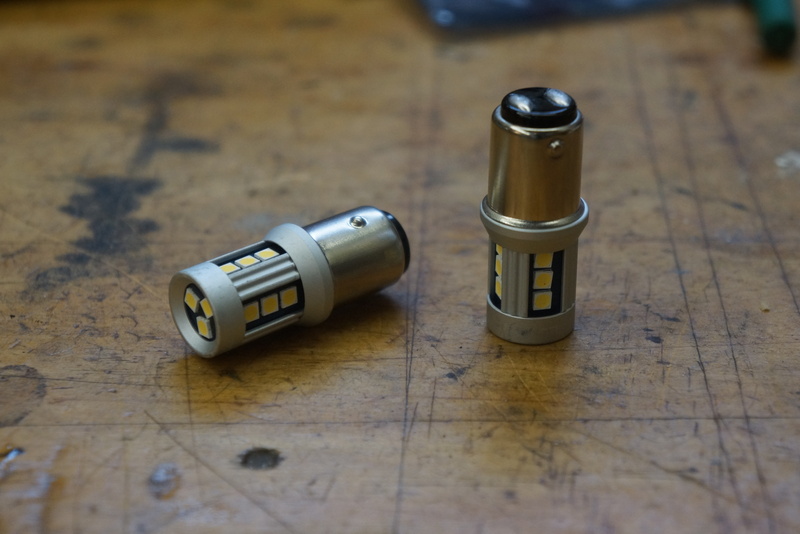 To the automotive purists, aftermarket LED lighting may have a bad rap. Your first thought may be of glare-producing headlights (more likely caused by HID lighting). Perhaps you’ve seen some tricked-out show cars with blue/green/violet LED lighting in front and rear lamp assemblies, even under the car, pulsing along with a 120-decibel sound system. The upgrade I pursued is much more straightforward than that. The aftermarket has made LED light bulbs available, in standard sizes, as “plug-and-play” direct replacements for incandescent bulbs. With the Miata, I wanted to start small, and at the rear, by replacing the combo tail/brake light bulbs (#1157) and reverse bulbs (#1156). I obtained several sets of bulbs from CARiD.com (and in full disclosure, this is the company where I’m employed). The LED bulbs are available in different colors. I got the 1157 bulbs in both white and red, and the 1156 bulbs in white. When replacing incandescents with LEDs, it is extremely important that the LED bulb is the same length, or shorter than, the bulb it is replacing. LEDs are available from different companies, and most companies offer them in different lengths. An LED bulb which is too long may not fit at all, or may press against the plastic lens, causing that lens to melt, or worse. My bulbs are the Lumen brand, available in 3 different lengths. 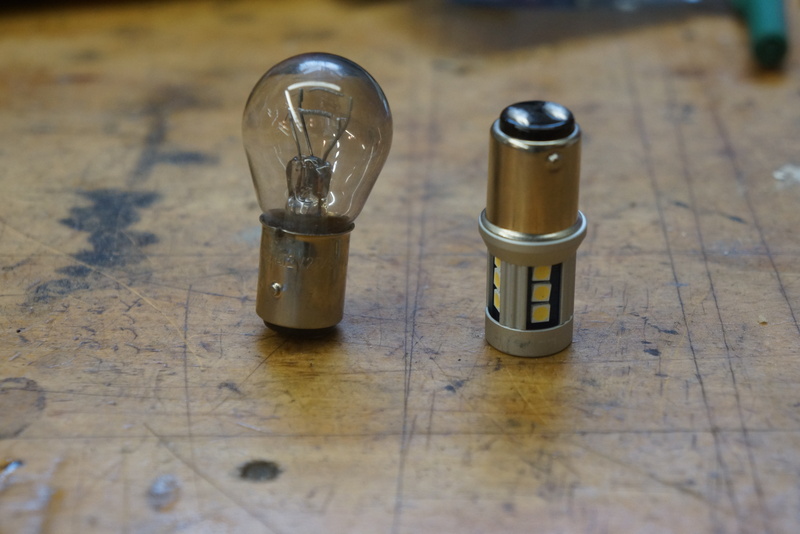 Generally speaking, the larger the bulb, the more light it emits. It therefore becomes tempting to decide on the largest bulb; again, make sure that it’s going to fit inside the assembly! In my case, to be on the safe side, I selected the shortest bulbs. With pieces in hand, I opened the Miata’s trunk and was pleasantly surprised to see the covers behind the tail lamp assemblies were easily accessed. Once the cover was removed (no need to disconnect the harness plugs), I flipped it over, and both bulbs were right there. I did note that the tail/brake light glass (“envelope” in bulb-speak) was darkened, probably dimming its output; however, the bulbs still worked. Wanting to make changes one step at a time, I swapped out the 1157s first, using the Lumen white LED bulb (the tail lamp housing has a red lens). To document the changes, I took photos, figuring that the camera doesn’t lie (but it might try to make the car look thinner). I put my Sony digital camera on a tripod, and set the controls to full manual. In this way, the camera’s light sensor would not automatically adjust the exposure, which could artificially make the light look either brighter or darker. With new tail light bulbs in place, I subjectively thought that the light output was brighter. The big improvement, however, was in the amount of illumination: now, the entire lens assembly was lit, compared to prior, when the upper corners remained dark. So far, so good. Next to be installed were the reverse lights. This was a great improvement, as the light is not only markedly brighter, the color is a pure white, compared to the hazy yellow of the incandescents. Lastly, I went back and replaced the 1157 LED white bulbs with the same size in red. My expectations were low, as I had run this same experiment at work several years ago with an older Honda Civic, and the red tail lamp bulbs behind a red lens were not as bright as white bulbs. 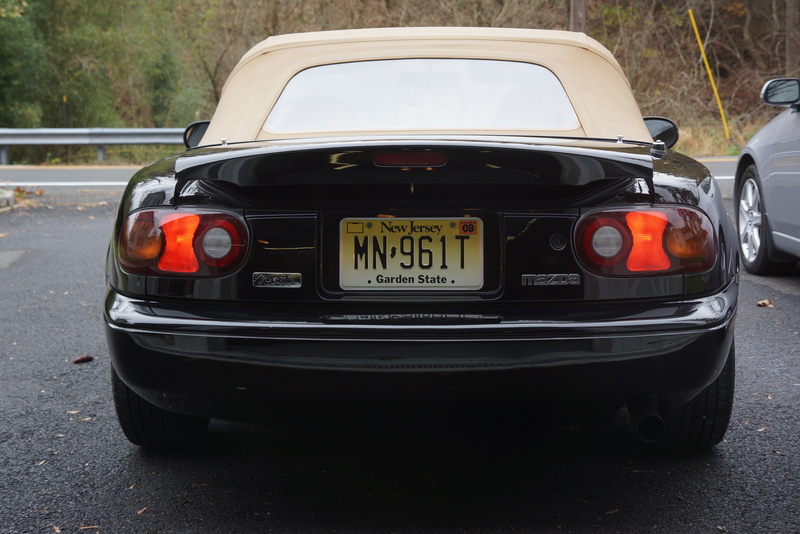 The Miata yielded a much better result: the light was slightly brighter, and it was redder too. If conspicuity was my goal, the red 1157s and white 1156s allowed me to achieve it. 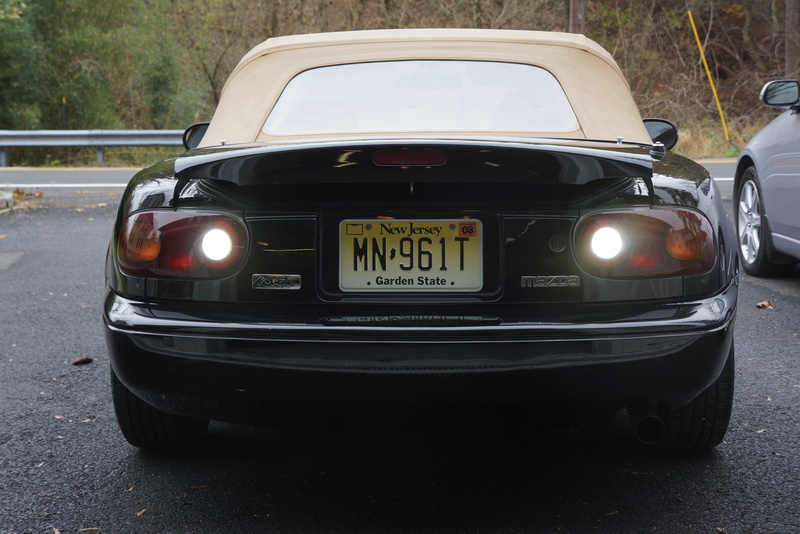 What’s next for the Miata’s lighting? I had considered upgrading the front and rear turn signals, but LED bulbs introduce a small hiccup: their low resistance causes the flasher relay in many cars to “hyperflash”, or, flash too rapidly. There is a fix in the way of a resistor, but that costs extra, and must be permanently mounted to the car, a modification that I’m not willing to make. The front and rear side marker lights would be a likely next step for LEDs. On the interior, the footwell courtesy lighting could really stand to get LEDs (the poor passenger compartment illumination is partly caused by lack of any overhead lights). 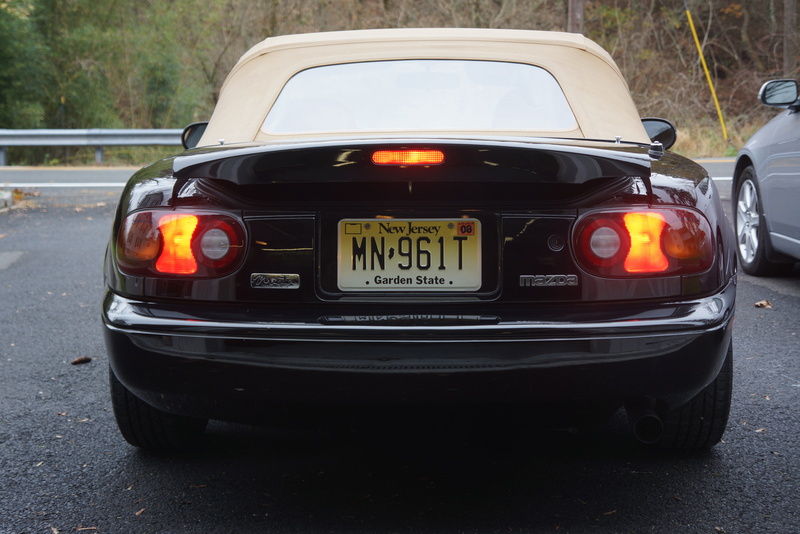 Was I surprised by the improvement in the Miata’s rear lighting? Not at all. The biggest surprise may only be that I waited this long to make the upgrades. Oh, and the Alfa will definitely be getting similar LED bulbs. Just don’t tell the AACA judges. “Reverse” lights, also known as “back-up” lamps, are wired to illuminate whenever (and only when) the vehicle’s transmission is in reverse. They are designed to both help light the way for the driver, AND, serve as a signal to others of the driver’s intention to move in that direction. In the U.S., reverse lights became required by law with the passage of the initial Federal Motor Vehicle Safety Standards (FMVSS) in 1968. Before that, back-up lamps were optional equipment for many vehicles, if they were even available. As a boy, I can recall seeing lower-line American cars with steel “blanking plates” in place of reverse lights. Sometime last year, a story made the news in New Jersey, which seemed to garner little attention in the press. The State Government announced that during calendar year 2017, “older vehicles” would no longer be subject to mandatory emissions inspection. 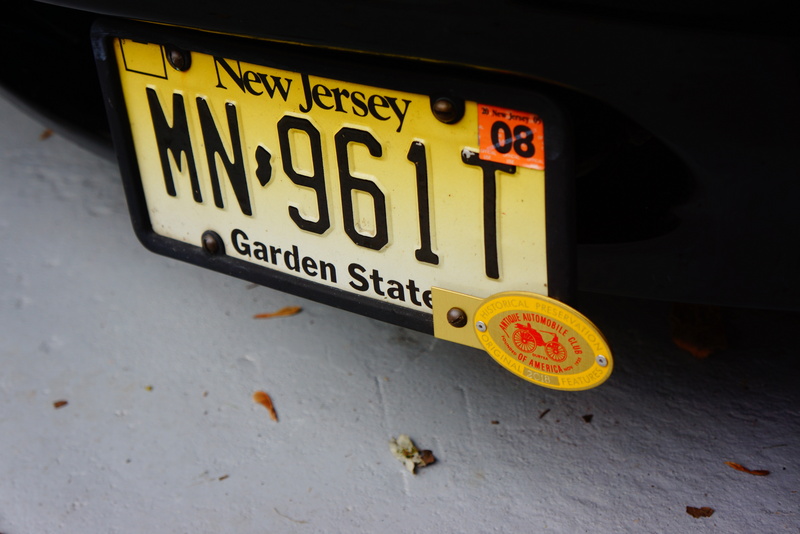 A quick refresher for those who do not reside in the Garden State: for years, NJ subjected passenger cars to an annual inspection, consisting of both safety-related items such as tires, lights, horn, etc., and emissions testing, covering both a tailpipe sniff and a fuel filler cap integrity check. A few years ago, the law changed from an annual inspection to a biannual one. A few years after that, the safety portion of the inspection was dropped. 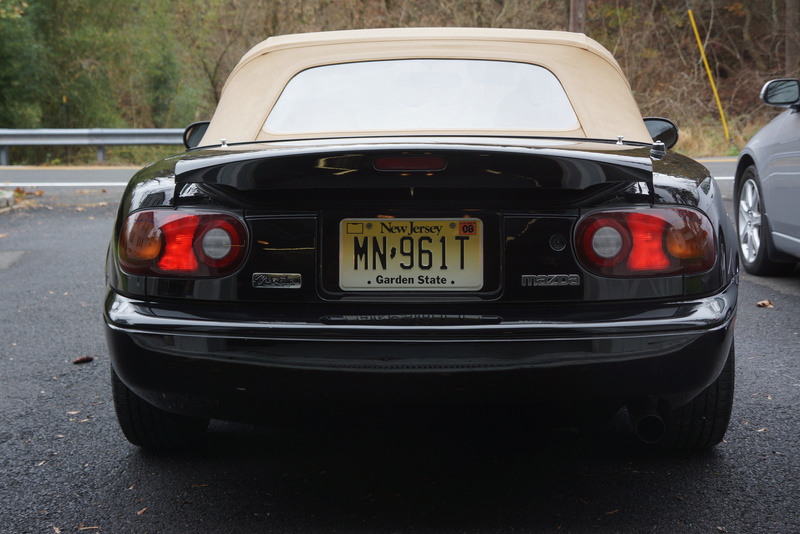 The announcement from the New Jersey Motor Vehicle Commission allowed that 1995 and older cars would no longer require any type of inspection. Model year 1996 and newer cars would continue as before, needing an emissions test every two years. Was the 1995-1996 cutoff arbitrary? Not at all. The Federal Government requires that 1996 and newer passenger cars possess “On Board Diagnostic” (OBD) testing capability with a standardized access plug, and standardized Diagnostic Trouble Codes (DTCs). The 1996 nationwide requirement was actually a Phase Two level. So-called OBD I was a California requirement, but never a Federal requirement. Even if not mandatory, most 1991-1995 cars have some sort of rudimentary ability to read DTCs through an OBD system. What does this technical discussion have to do with the State of NJ? Simple: cost. 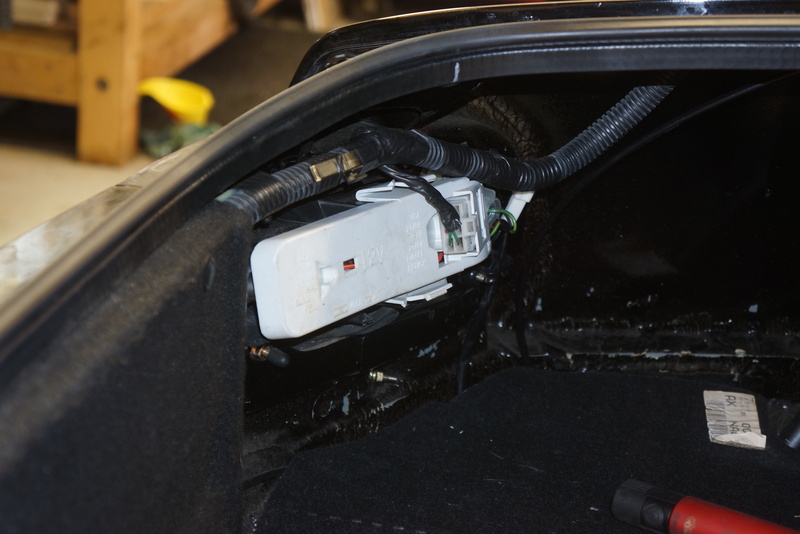 For a NJ inspection station to test emissions, two sets of equipment were needed: one to read OBD I (1995 and older), and one to read OBD II (1996 and newer). There is no compatibility between the two. The State Government saw this as nothing more than a money-saving decision. 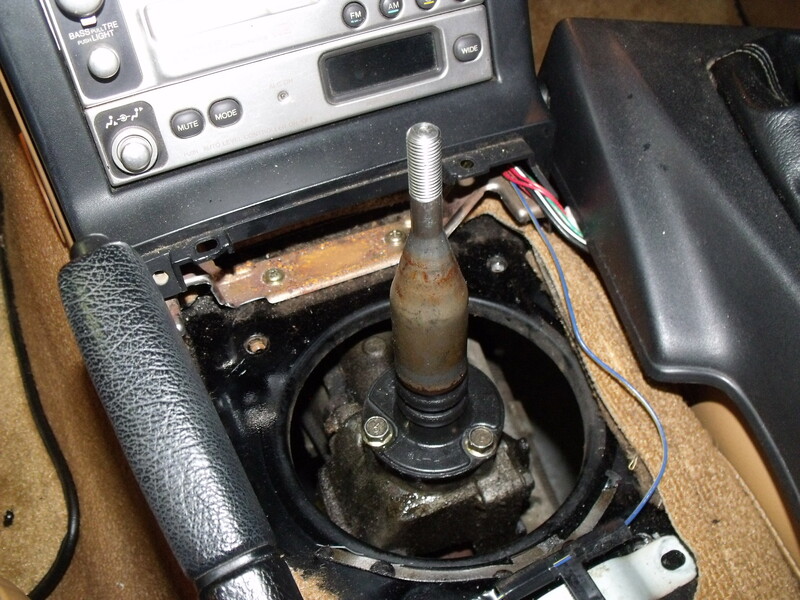 By eliminating testing for the older cars, only one set of test equipment must be purchased. 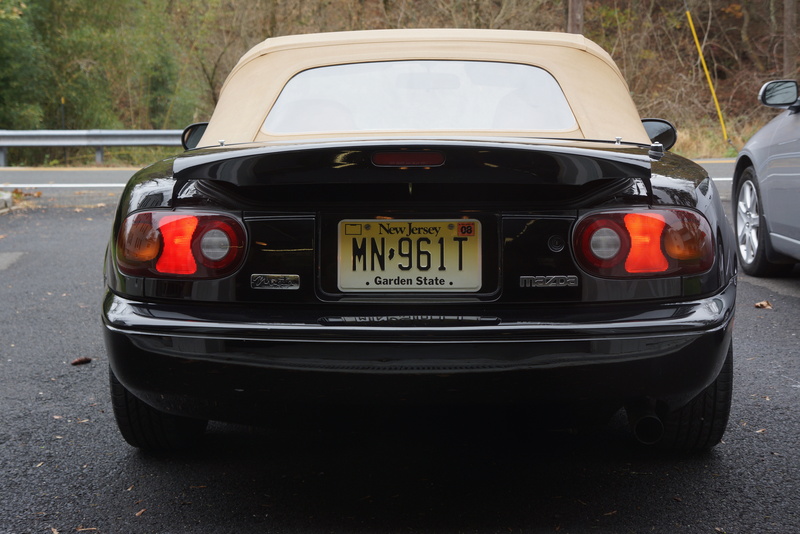 Speaking from personal experience: my 1993 Mazda Miata, which I’ve owned since 1996, had always passed NJ emissions, until it failed in 2015. There were no warning lights, nor did the car behave any differently. 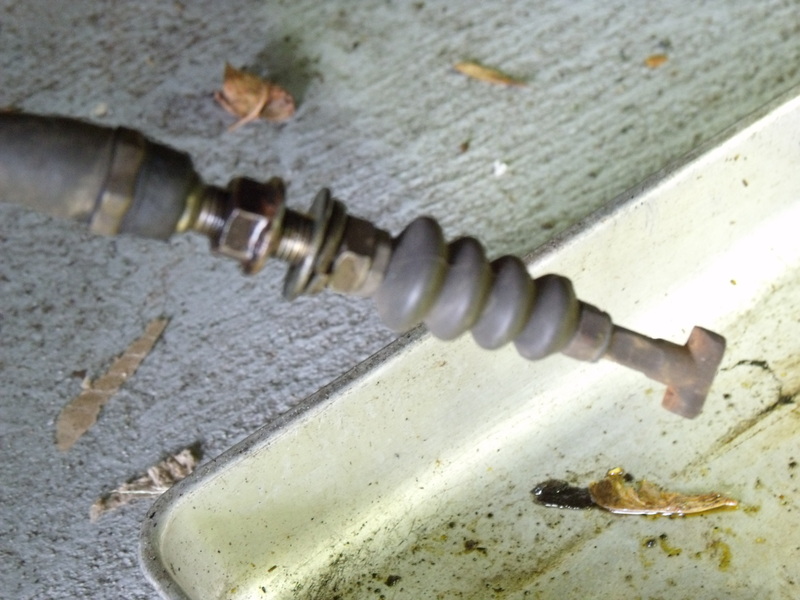 It turned out that the car needed an oxygen sensor (for which there is no regular replacement interval). Had I not had the vehicle inspected, how would I have known? Without getting too political, this comes down to a difference of opinion between those who believe in greater individual responsibility, versus those who believe that our government does occasionally need to act in order to protect the greater good. In this case, I see both sides. I actually have a bigger issue with the removal of all safety inspections. Cars alongside me on the road may have bald tires, worn-out brakes, and inoperative headlights, but are still operating legally (and yes, as stated above, they can be cited for obvious defects. When is the last time that happened in New Jersey?). It’s in the glove box, but I didn’t check to be certain that the VINs match! 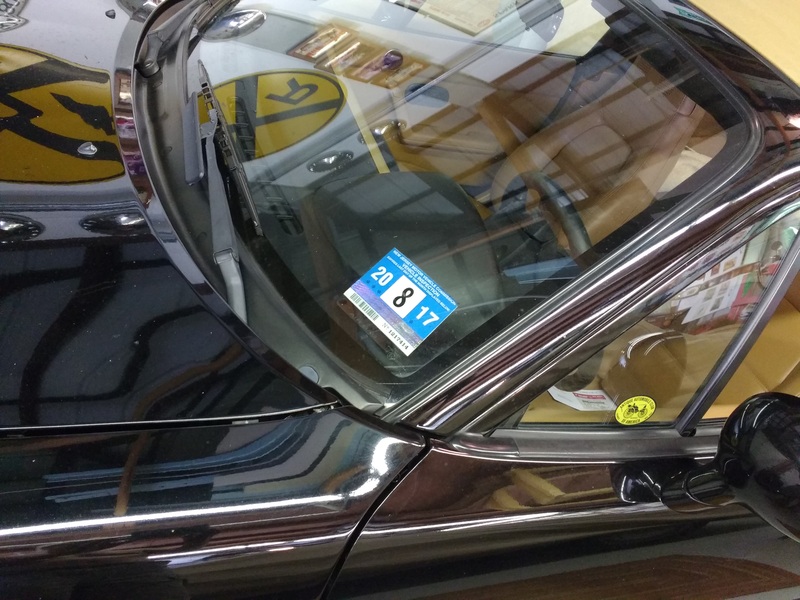 Yesterday, I took a razor blade to the inspection sticker, scraped it off for the last time, and spent quite a few minutes cleaning 24 years’ worth of adhesive residue. The new notice went into the glove box (thank goodness the state didn’t require that it be displayed on the dashboard), and I stood back to admire the newly-bare windshield glass. My 1993 Miata looks just like all Miatas built from 1990 through 1997. How long might it be before I’m stopped for driving with a missing inspection sticker? My ’93 next to one of Mazda’s newest, the CX-5; note the relative heights!